January 27, 2019 By Liz 12 Comments Note: This post may contain affiliate links. 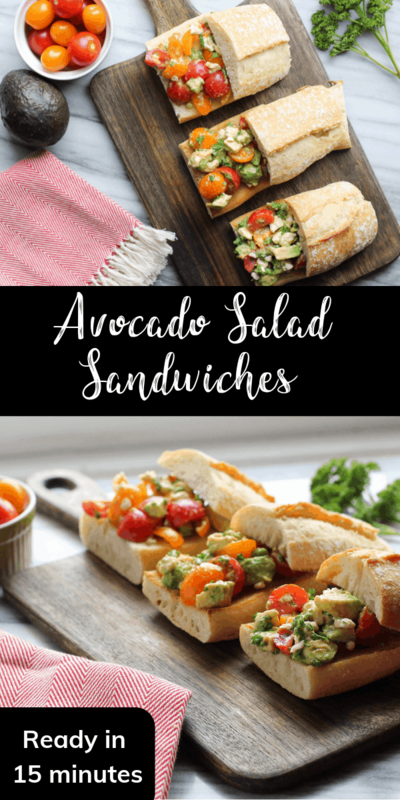 These easy avocado salad sandwiches can be made in just 15 minutes! With creamy avocado and salty feta, they’re perfect for a quick lunch. While we were in Minnesota over the holidays, my mother in law made a Feta & avocado dip that was amazing. I couldn’t get the combination out of my head and I realized that it would make a great sandwich filling! With just a handful of ingredients and a few minutes of chopping, you’ll have these sandwiches ready to go! Obviously, you could also serve this as a dip, or you could even make mini-sandwiches for appetizers! I wouldn’t recommend making this too far in advance since the avocado will start to brown. This is best served immediately. You can also skip the step of toasting the bread if needed. But I liked the creamy salad texture with the crusty, crispy bread. I like to pick out avocados before they’re close to being ripe. Most of the time, if they’re already ripe in the store, they’ll be bruised from people squeezing them. To ripen them faster, I keep them in a bowl with bananas! The ethylene gas that is released from the bananas will help soften the avocados quickly. Once the avocados are soft, I put them in the fridge. This will keep them at their peak of ripeness for a bit longer! Lightly brush or spray olive oil onto the inside of each of the baguette pieces. Toast in the oven for 3-4 minutes until just lightly browned. In a large bowl, combine the olive oil, garlic powder, and parsley. Add the avocado and tomato and gently combine, being careful not to completely smash the avocado. Add a large pinch of salt, to taste. Note: Measuring fresh herbs can be tricky. Remove the large stems from the parsley brunch, then roughly chop the leaves. Gently scoop into a ⅓ cup measurement. The leaves should fill the cup, but shouldn’t be tightly packed. 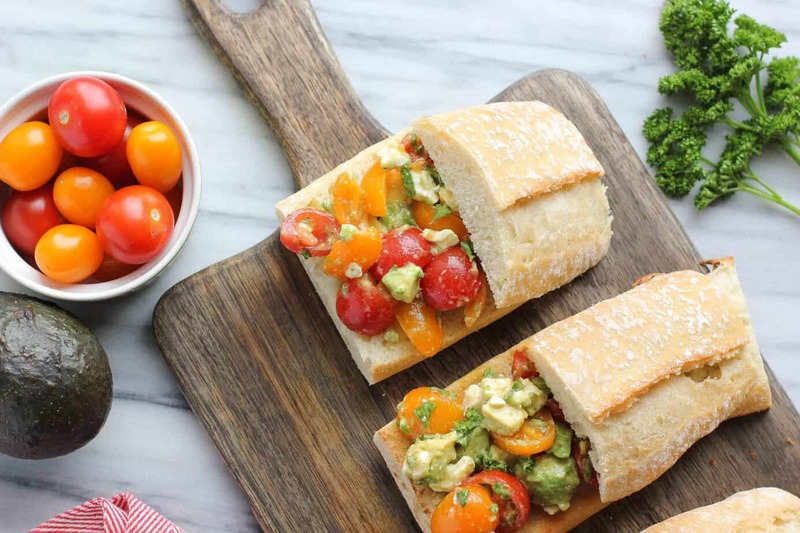 If you were making these for a crowd our party, you could slice the bread into smaller rounds and top with the avocado mixture. It makes a great bite-sized appetizer! 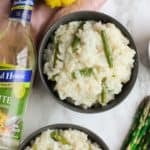 If you wanted to cut down on the bread, you could also serve these as open-faced sandwiches or even as lettuce wraps! I can’t wait to make these when tomatoes are back in season and the tomatoes are even sweeter and juicier! What’s your favorite kind of sandwich? All of your recipes look so delicious! 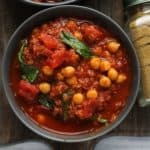 I like the format of your recipes, do you use a plug-in for your recipe format and if so, what do you use? Thank you. I can’t get that taste out of my head either what a great idea making it into sandwiches. Right?! It’s just so good! 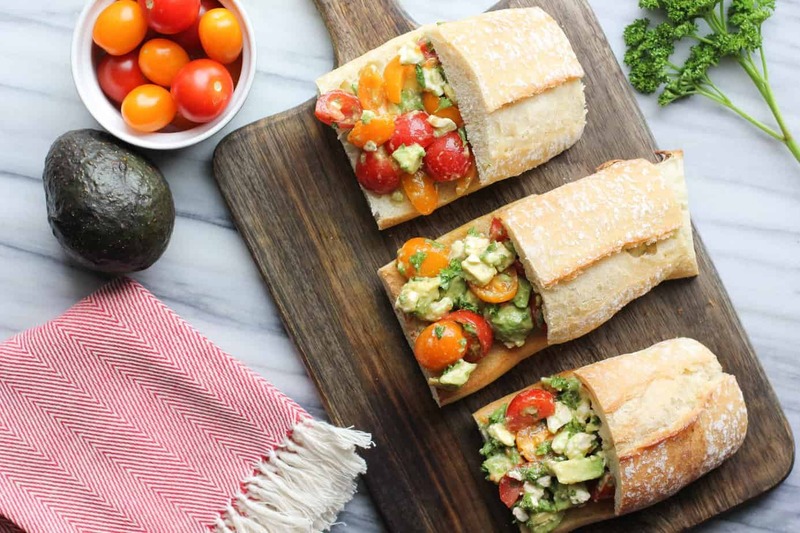 I’ve never even thought about avocado sandwiches but that sounds like such a good idea. Thanks for sharing. 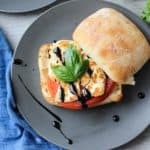 I love a sandwich with mozzarella or egg salad! And avocado on a chicken sandwich is wonderful. I love the idea of an avocado salad. I can just taste that! fresh, creamy and the combination of the salty feta with the avocado must just be perfect! Can’t wait to give this one a try. What a great lunch idea! 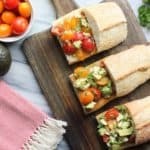 I love avocados, and this sandwich looks bright and satisfying! This sandwich sounds so tasty. I love the look of all that creamy ripe avocado. 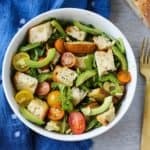 I love this easy and delicious avocado salad on top of crunchy bread. Perfect for lunch or a light dinner. Your recipe sounds delicious and so easy. 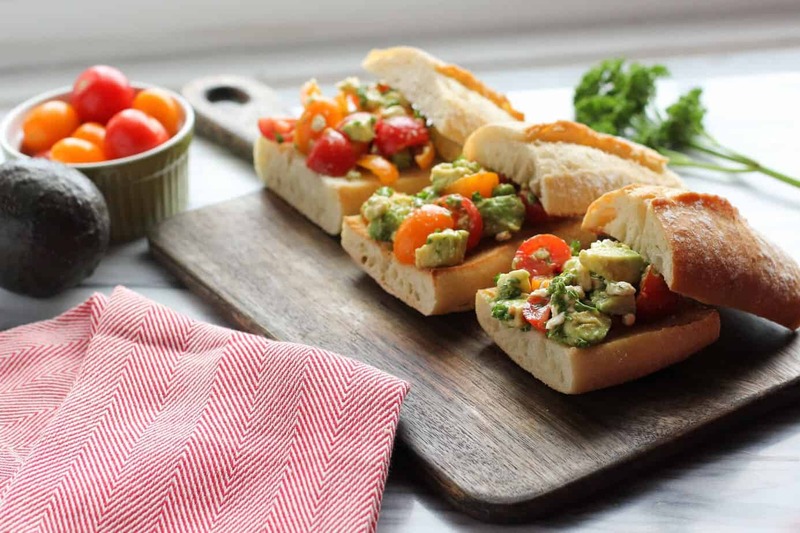 I can imagine toasting the baguettes makes a big difference in taste:) Love the colours and your tips regarding avocados.